$7.99 to $32.99 & FREE Shipping on orders over $59 $35. 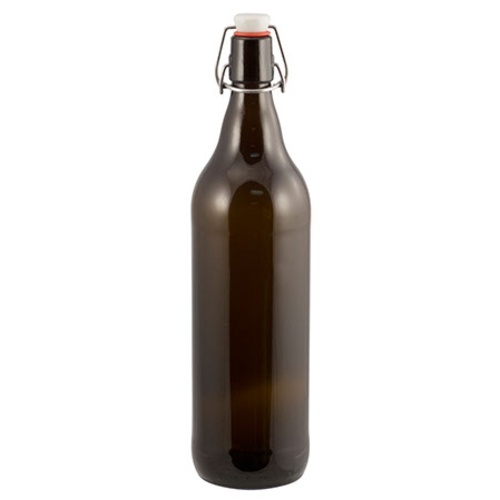 A very cool 1 Liter (33.8 fl oz) flip top growler. Great for taking your beer with you. 50% larger than a 22 oz bottle but half the size of our 2L growlers... often the perfect amount to share with thirsty friends. Comes with plastic flip top on wire bale which must be installed before use. Hard to find. Great price. To meet the free shipping requirement. Tired of saving individual beer bottles. Would rather just have less bottles, but larger volume. If I fill one of these from my kegerator, how long will it stay fresh? Assume I fill it, cap it and don't open it. BEST ANSWER: Hello John - Typically we wouldn't recommend going more than a day after filling from a faucet, as the beer will oxidize quickly. This is where counter pressure bottle fillers work rather well. What type of chemicals does this products contains that is known to the State of California to cause cancer?. BEST ANSWER: Hi Pedro - Likely the rubber grommet for the cap.